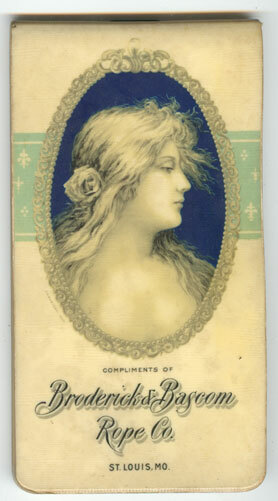 1904 Worlds Fair pamphlet distributed by Broderick & Bascom as marketing materials. 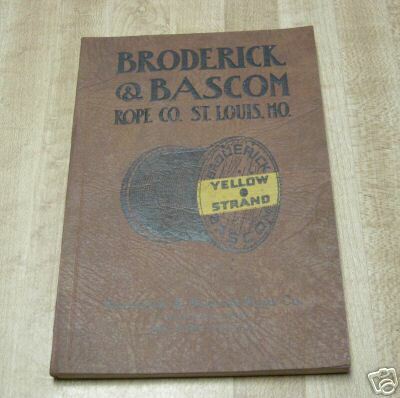 Small note pad distributed by Broderick and Bascom Rope Co. St.Louis, MO. Very fascinating item. Not just a blank notepad, but also filled with information pages. Even starts with a table of contents, which includes :A Few Facts of the World We Live In, Antidotes for Poisons, Calendars for 1903,04,and 05, Foreign Currancy and US Value, Official Population of the US,Postal Distances and Time from New York City, Simple Rules for the Game of Whist, Wedding Anniversaries, US Presidents, and more! A fantastic item. Cover is Celluloid covered. Lovely printing of a pretty lady. 1904. “ INDUSTRIAL WIRE ROPES "
Issued in 1944 by Broderick & Bascom Rope Company, St. Louis, Missouri. A light brown soft cover booklet with black lettering and an illustrated front cover. The booklet was aimed at the general contractor or rope user who needed general information on how wire rope could help in their construction activities. Includes a complete set of data sheets on wire rope, mathematical tables of general values, general recommendations on many types of equipment and fundamental data on slings, methods of calculating sling loads, installing wire rope clips, splicing and attaching sockets. Profusely illustrated throughout. 96 pages, including the index. 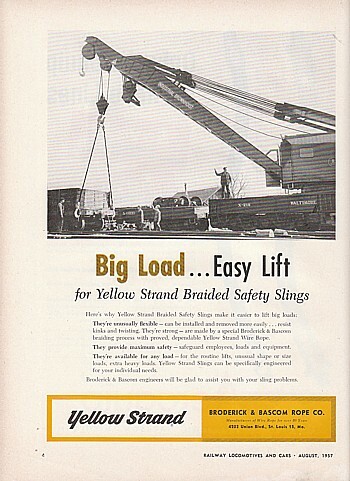 Ad Caption: "Big load - easy lift for Yellow Strand Braided Safety Slings". Condition: Ad is in very good condition but with some light soiling/stains at bottom edge of page. Any yellow tint is a result of our scanning process and not with the ad. Some ads are larger then our scanner, and may appear cropped down. Scan may show wrinkles or crookedness that is not in the ad. Dimensions: A full-page color ad - measuring approximately 8.75" by 11.75". The ad may be larger than our scanner and may appear to be cut off, but the entire advertisement is there. Notes: All ads are original ads removed from vintage magazines. These tear sheets are never a reprint or reproduction. These original magazine pages look fabulous when framed. Decorate your home or office or purchase as a gift for family and friends. Ads are also great resources of historical documentation for collectors. 1942 BRODERICK & BASCOM ROPE CO., St. Louis, Missouri, Print Ad for their YELLOW STRAND Preformed Wire Rope. "Wire Rope smooths the road to war"
Per Jun 2007 article in MISSORUI LIFE magazine, Broderick & Bascom Rope Company sold to Keystone Steel & Wire in 1966. Subsequent owners listed to the left. In 1980 the plant was moved to Sedalia. WRCA corporate headquarters in St Joseph.